Tough Armor Aluminum and Braided design Allows for More Durability and Easier Storage. Specification - 6.5 Feet / 2 Meter, 30-Pin To USB Sync and Charging Cable. Complete Charge and Sync Compatibility With All 30 Pin iPhone (1/ 2/ 3G/ 3GS/ 4/ 4S), iPad (1 /2 /3), iPod Touch (1 to 4), iPod Nano (1 to 6). Ultra Fast Charging,Extra Strong,Ultra-Resistant.Up To 30% Faster Charging Than Conventional Cable. 18 Months Worry-free Product Guarantee for Every Purchase from IMKEY INC. Professional technical support and always satisfied customer service 24 * 7 available. ï¿½ï¿½Tough Armor Aluminum and Braided design Allows for More Durability and Easier Storage. 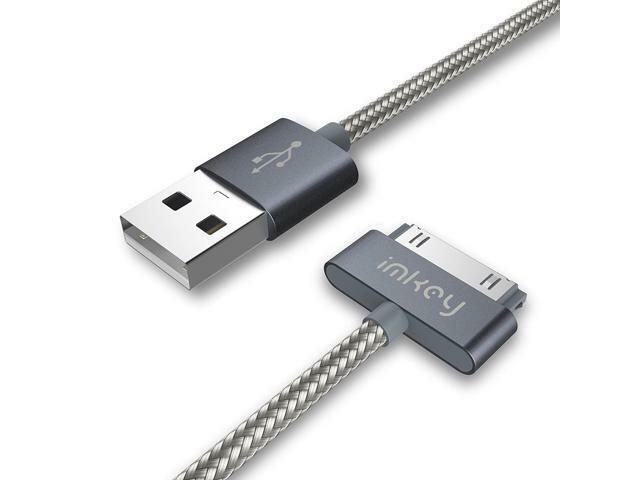 ï¿½ï¿½Ultra Fast Charging,Extra Strong,Ultra-Resistant.Up To 30% Faster Charging Than Conventional Cable. ï¿½ï¿½18 months worry-free product guarantee for every purchase from IMKEY INC.
ï¿½ï¿½Professional Technical Support and Always Satisfied Customer Service 24 * 7 Available. This item is covered by worldwidesupermarket Return Policy.